But how? When the enemy whispers lies that we are not smart enough, pretty enough, or rich enough? Or are you too dumb, too loud, too quiet, too thin, too fat, too much or not enough? What if you don't have what it takes to be who you really want to be?" In Looking for Lovely, Annie F. Downs shares personal stories, biblical truth, and examples of how others have courageously walked the path God paved for their lives by remembering all God had done, loving what was right in front of them, and seeing God in the everyday--whether that be nature, friends, or the face they see in the mirror. 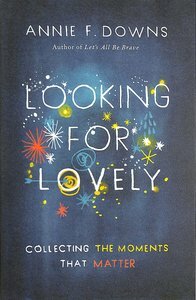 Customer Reviews For "Looking For Lovely"
I just devoured this gorgeous and life-giving book! Annie just writes with such honesty and whimsy; I didn't want it to end. If you have been looking for encouragement or just a fun non-fiction read, please consider this book. I couldn't have been happier with Looking for Lovely! Annie F Downs is a 30-something author of four books, based in Nashville, Tennessee. In this most recent book, released in 2016, she follows her memoir 'Let's All Be Brave' with personal anecdotes and a collection of 'lovely' moments. She is honest and candid. Life for her is not perfect. She struggles with self image, but recognises that she is a loved creation of God. Her faith is evident as she weaves Gospel passages and stories through the short chapters. This book is one I would give to a teenager or 20-something girl who wants to find out how to discern her calling. The basic premise for this book is Annie looking at the simple things, the lovely things that piece together to make up a life. She doesn't pretend to have it all together, and frequently talks of her own 'broken crazy' that keeps her from realising her full potential. But yet, she finds beauty in the brokenness and writes it down. It might be a glass of almond chai in a Nashville cafe, a concert, a night out with the girls, a delicious piece of sushi or a quiet time of prayer. She looks for the lovely things in life, and finds joy even in her struggles. This is a brave, honest and delicious book.